A total of 30% of all of FDA inspections conducted in 2017 had 483’s generated resulting in a total of 5,045 FDA 483’s across 17,487 audits in total. In addition, 498 Warning Letters were issued during the same timeframe. The most common observations identified in 2017 across the Biologics and Drug Manufacturing facilities appear to be those that are easiest and quickest to address – SOP and documentation deficiencies. However, these deficiencies are often a symptom of an underlying issue and the corrective action is rarely as straight forward as update to an SOP to prevent recurrence. This was closely followed by poor documentation practices such as non-concurrent documentation, incomplete documents, poor organisation and missing documents. In many cases, SOPs were found to be either poorly written or not followed. Training and inadequate CAPA practices were also common. PharmaLex recommends that the above link could be a very useful tool to help companies to prepare for inspections and to become “inspection ready” at all times. Read the observations carefully and identify, with the support of your local subject matter experts, whether any of these apply to your company and require remediation prior to the next planned inspection. Create a list of areas to evaluate at internal reviews and audits. Incorporate this information into site GMP training and inspection readiness training. Ideally the output of this review, if performed correctly, should help prevent generation of findings during an inspection. Alternatively, it could potentially reduce the criticality of findings issued during an inspection if there is a robust CAPA plan already in place to address a known issue. 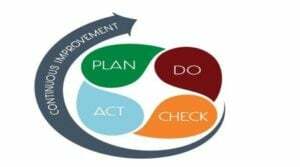 Why not incorporate the use of the Plan-Do-Check-Act (PDCA) model into your quality system? Plan: Recognise an opportunity and plan a change. Check: Review the test, analyse the results and identify what’s learned. Act: Take action based on what was learned in the study step. If the change did not work, go through the cycle again with a different plan. If successful, incorporate what was learned from the test into wider changes. Use what was learned to plan new improvements, beginning the cycle again.